For many busy parents, it can sometimes feel like a victory just to get everyone dressed and out of the door in the morning, let alone find time to exercise. If you’d love to get fitter but struggle to find the time in your schedule, our tips below might help get you moving. Join a family friendly exercise class with childcare included. 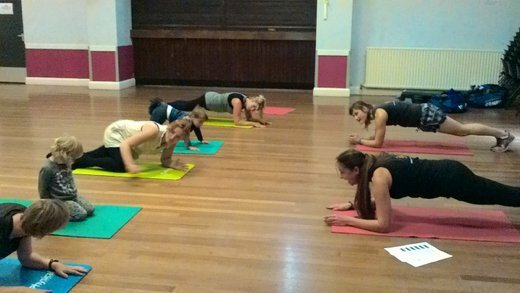 Activ8 run a fantastic adult fitness class every Wednesday in Lancing, which includes childcare for the duration. It’s a great workout for adults, and lots of fun for the children too. We keep them busy and entertained, and encourage them to join in with the class where appropriate. Read more information about Lancing Adult Fitness Class. Take up a new activity. Simply going for a walk is an excellent form of exercise, but just walking can sometimes be a little bit boring for children. Try out Geocaching, a fun outdoor treasure hunt that gets you out and about exploring your local area. Kids love hunting the treasure, and the whole family gets to work out. Choose a time and stick to it. If you plan exercise at the same time each day, or each week, you’re more likely to stick with it. For example, you could go for a swim after dropping the children at school or, if you work, see if there are any fitness classes that take place in your lunch break. Exercise when your children do. Taking part in an after school club is a great way for children to exercise, socialise and unwind after a busy day. Activ8 run a range of after school clubs. If your child is taking part in one of our clubs, why not use the time they’re at the club to do some exercise yourself. For more great ideas on getting the whole family moving, check out the Activ8 website and come along to a class in your area.